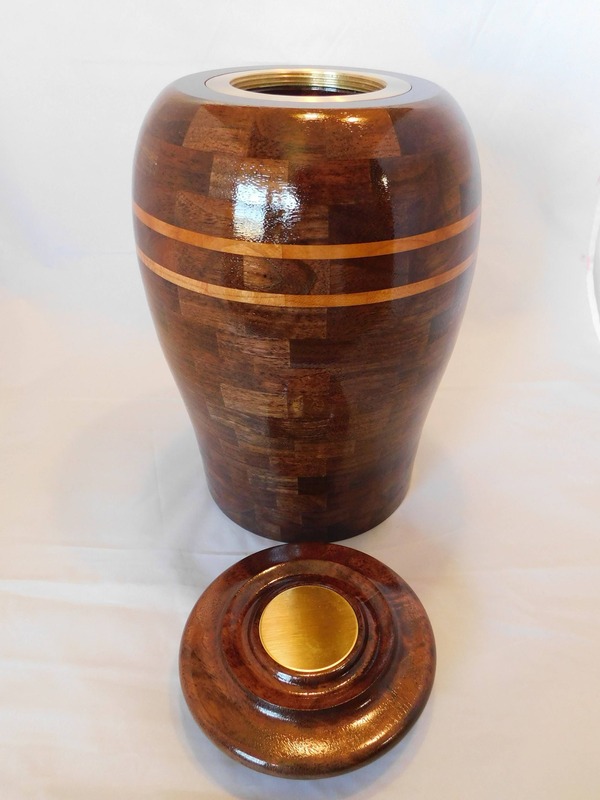 It took a long time to design a respectful and affordable hand made urn with a high quality brass screw on lid. Wood can be affected by seasonal changes, so I created the solid brass threaded rings we use. 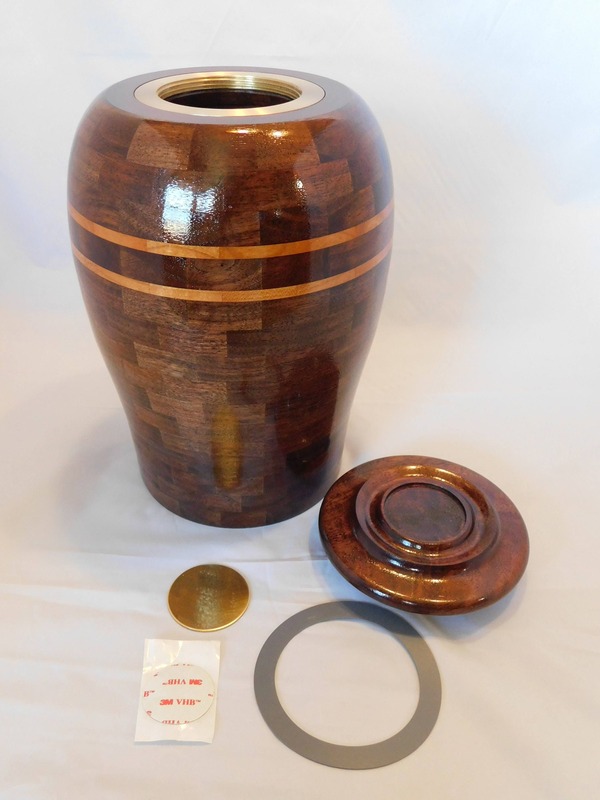 There is a gasket that seals the lid on the urn. Our family harvested the walnut and cherry logs when we lived in Indiana, so I know the quality is there for you. 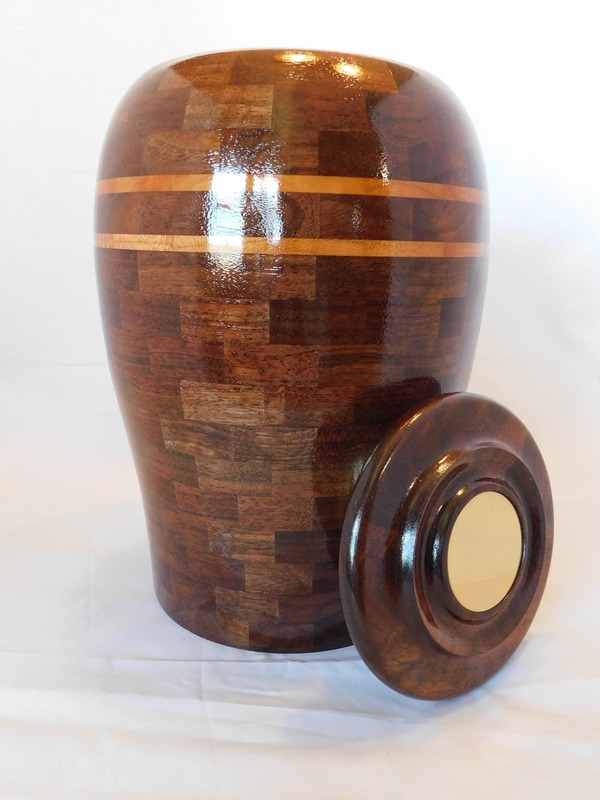 All our vessels are made of these fine quality, kiln dried, hardwoods. Walnut brings a warmth and subtle color that blends into most homes and can be respectfully displayed anywhere. Solid brass rings are used to screw on the lid, and the lid is sealed with a gasket. 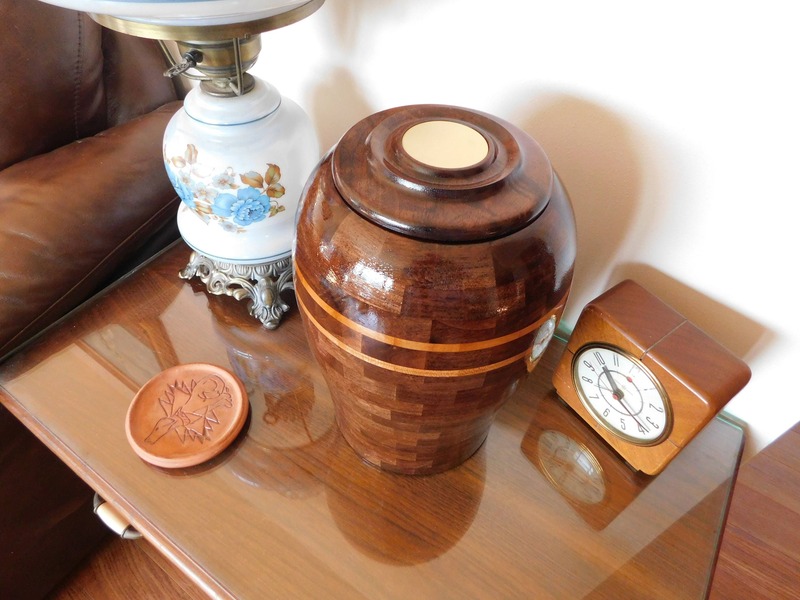 If your wishes are to permanently close the urn, glue can be applied to the brass threads. 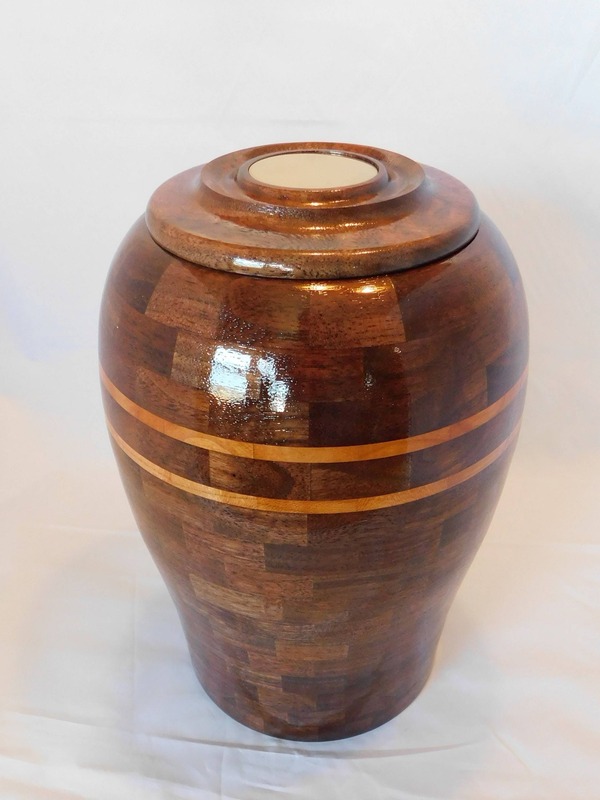 Kiln dried walnut and black cherry hardwood is used throughout. Numbered 114. In stock and ready to ship via USPS Priority with tracking notification. 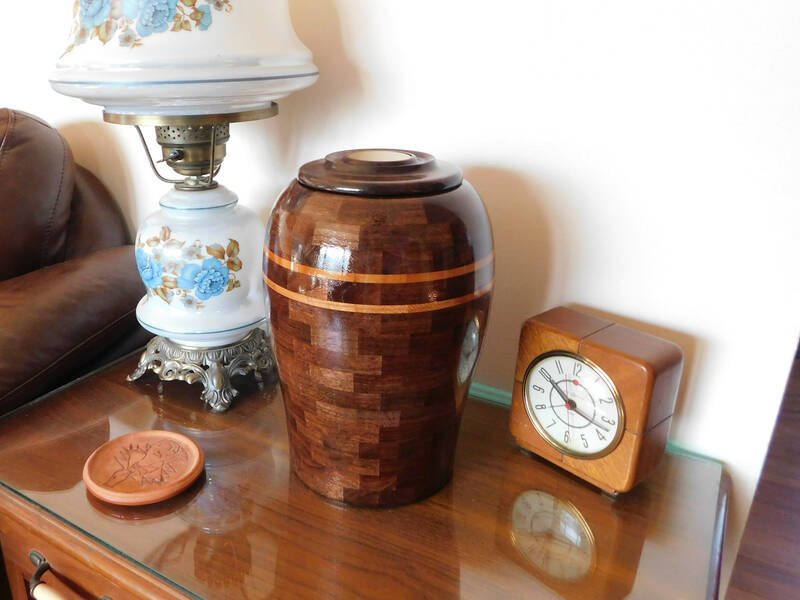 Shipping cost is included in the price of the urn, within the US. This memorial is made of 17 segmented rings totaling 272 segments. 15 are walnut with 2 accent rings of black cherry. 11" high and 7 - 1/2" wide, and a 3" opening in the threaded solid brass closure. Inside volume is 230 cubic inches. 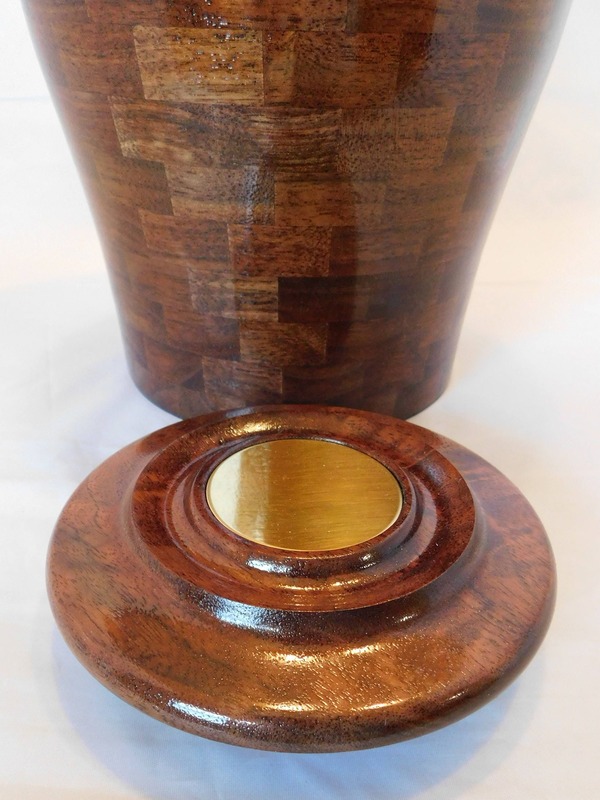 The lid is walnut and has a 2" thick solid brass polished disc for inscription. The 1 1/2" 3M adhesive disc allows the disc to be added after the dedication is inscribed. PAYPAL and credit cards are accepted by using Esty's Direct Checkout. After your payment completes, we ship your selection. We ship in one or two business days after payment. We print your shipping label from the input you provide during direct checkout with Etsy. This will provide you an email with the tracking number. If shipping costs are included in the price, we will ship via USPS and send you the tracking information. International orders would ship using USPS First Class Package International Service. Under the European Union Directive on Consumer Rights, buyers residing in countries that are subject to these regulations have 14 days after receiving the item to make a return. This right does not extend to custom-made products. If a buyer exercises this right, payment for the item(s) sold, including original shipping charges, will be reimbursed. The buyer is responsible for paying return shipping costs and will not be reimbursed for Import Duties and Fees/Import Taxes/VAT charges that your country may impose. PLEASE BE AWARE that you, as the buyer, are responsible for any and all Import Duties and Fees/Import Taxes/VAT charges that your country may impose on you for purchasing merchandise from outside your home country. From Wanut To Antlers assumes no responsibility or obligation if buyer refuses to pay any custom charges and a package is returned to us. If you are unhappy with your order for any reason please contact us within 5 working days of receiving your package. We will do our best to resolve the problem quickly. Refunds for the item(s) are given once the item is returned in original condition. Shipping and handling fees will not be refunded. Buyer is responsible for paying return shipping costs. Currently we will refund the postal cost when you order more than one item at a time to the same address in the US. Outside the US we will consider refunding half the postal costs on an individual basis. This offer does not apply to the brass engraving discs.